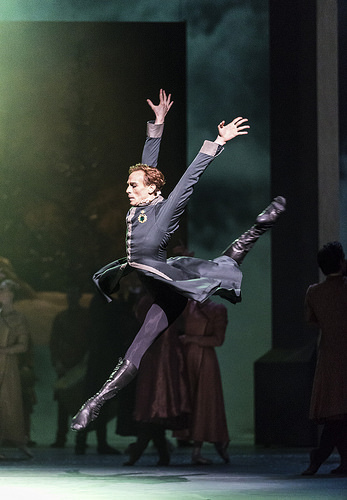 It was a crisp and still-sunny spring evening in London on Tuesday , and I was an audience member in the opening run of the Royal Ballet’s The Winters Tale, adapted from Shakespeare by Christopher Wheeldon. Shakespearean plots are hard to write in summary. Even Shakespearean scholars can struggle with it, with all the various characters and to-ing and fro-ing. (The Royal Opera House provides a pretty good summary here.) But on the page and in performance all this potential confusion is solved as we see the characters living and developing the plot. I wondered – how this might this work in dance? Could silent storytelling adequately handle the plot? Added to this, Shakespeare is much more than the story- can dance be Shakespearean? The first act takes place in the courtly setting of King Leontes’ Bohemia. Amidst twirling snow, the scene is set with some lovely work from two young boys as the growing King Leontes and King Polixenes. Handing their crowns to the adult characters, Edward Watson and Federico Bonelli, one little one becomes the young prince Mamillius. The robust and yet moving male friendship between the two kings is beautifully danced as Watson and Bonelli mutually support and lift each other. The friendship between the two kings then interweaves with the queen Hermione, and in a touching moment Polixenes lifts Hermoine and she flows downwards to kiss Leontes. The onset of Leontes’ jealousy is pushed back slightly later in time compared to the text, an effective choice that lets the audience read the physical vocabulary of intimacy between the royal couple, and follow it as it becomes grotesquely contorted in sexual jealousy. Edward Watson at Leontes is an absolute joy to watch. Bonelli of course is an accomplished dancer and a delight as Polixenes, but Watson is transfixing in his fluidity of movement and command of performance. His acting is seamless; he utilises the tinest gesture of his fingers, not just in dancerly grace, but to communicate a stunning depth of character. His jealousy is beetle-like as he scurries on demi-pointe; at moments his hands become skittering insects that consume him. At another moment in his tortured suspicion he appears cheshire-cat like on Polixenes’ shoulder, rolling with his rictus grin slowly down his arm to eventually face the queen. This is an illumination, rather than simplification, of the Shakespearean character, and an incredibly engrossing theatrical experience. Act Two opens as an effective contrast to the intense psychological drama of the first act, with a pastoral pas de deux leading into country dances, the trilling birdsong woodwind of the orchestra accompanied by musicians with traditional instruments on the stage itself. The corps are engaging and the choreography here makes reference to renaissance jigs and capers with feet becoming turned in – and caprioles, of course. Sarah Lamb as Perdita is dressed in royal purple, perhaps referencing her birth and innate royalty, however this works visually to set her apart from the pastoral scene; she never seems to inhabit the role of a blithe and innocent shepherdess. Her incredibly lean and languorous physicality lends her an ethereality that makes her breathtaking in the second act of Giselle, for instance, but reads at odds with Perdita as the simple pastoral maid. Her dancing is beautiful, and her Perdita sweet and delicate, but she seems framed and choreographed as a classical porcelain ballerina, not a complex narrative actor. The Giselle comparisons are perhaps inevitable for a bucolic scene of dancing villagers; and, similarly to the Romantic ballet, the villagers do seem to caper for extraordinarily long time. The unravelling of Florizel’s identity takes place in-and-amongst, and so the young pair’s flight from Polixenes seems somewhat abrupt as the act comes to a close. Act Three ties up the story, and the statue moment as Hermoine is restored to her family is nicely executed, however the third act lacks the power of the intense and tragic first, and the cast here have little opportunity to engage in complex work as the denouement cracks on at a brisk pace. The costuming throughout is simple and effective, with good use of colour and sparing embellishment. Leontes’ costume is especially effective, as subtle costume changes allow for an exciting variety of movement within the regal silhouette. The country maidens in the second act are gorgeously attired in flowing georgette with bodices that reference Renaissance girdles with under-bust stays, and Perdita’s country wedding outfit is exquisitely simple. There is also some incredible use of fabric in the mise-en-scene. My musical knowledge is nil, but Ballet Friend really does know her stuff. She wished the music had been more powerful, a sound wall to reflect the power of the story, and called to mind some orchestral shipwrecks that could have been drawn upon for the storm in the abandonment scene. Wheeldon worked with the composer Joby Talbot on the Royal Ballet’s Alice in Wonderland and the score in that production worked well to accompany the storybook fantasy. However, the undercurrent of tragedy in The Winter’s Tale didn’t quite stir in the depths of the music. The Winter’s Tale can be quite thorny, as the violently jealous Leontes remains unpunished. The statue of his young son, dead in shock at his fathers jealous rage, remains on stage as reminder of the tragedy Leontes has caused. But all is well, and the young royal couple are bedecked in white for a courtly marriage. Maybe ballet is a world where the improbable coincidences of the story and the happy resolution of an unambiguous ending are tropes that are expected and enjoyed, similar to Shakespeare’s audiences’ taste for marvellous romance? Watson’s portrayal of Leontes could be read literarily, and his ‘diseased’ jealousy, his ‘tremor cordis’ and tortured isolation could all be neatly matched up with his characters’ choreography. Well-read though the production undoubtedly is, Watson’s performance is more than a physical translation of words on a page. He brings the dance production into dialogue with the Shakespearean text, with his eloquent phrasing and nuanced acting – the different medium acting as a new dimension. Watson is very diffident taking his bows, preferring to indicate Hermione, Paulina and Perdita as recipients of the audience’s affection. I was on my feet for him, though. His dancing is Shakespearean. Tuesday 15th April: The Winter’s Tale, ROH. So soon, woop! This’ll be interesting – as a literature and theatre student (I was going to say scholar and then checked myself ha) I’m really interested in narrative ballet made from literary texts. I’m familiar, as well, with the world of Shakespeare purists, so I’m intrigued to compare and contrast dance-based criticism and Shakespeare- and text-based thought. Thursday 19th June: Romeo and Juliet, RAH. Daria Klimentova’s last evening performance – she does one more matinee after this – before her retirement from ENB. Very excited for this! I saw Romeo and Juliet once as a tweenager and really wasn’t impressed, I was extremely serious about the power of literature and had next to no interest in dance. I wonder what my more mature and dance-loving self will make of this production. Tuesday 12th August: Firebird/Marguerite et Armand, Mariinsky at the ROH. I really like Uliana Lopatkina, who is dancing in Firebird. I have no knowledge at all about either of these ballets so it will be a completely new experience for me. I’m really looking forward to watching a Russian company dancing, too. Wishlist: Swan Lake is on this summer danced by the Mariinsky at the ROH. I have seen the Matthew Bourne version but never the classical ballet! I am very interested in seeing more Contemporary Ballet, too, especially in studio settings like the Linbury. A company that I missed performing very recently – are Ballet Black returning to London this year I wonder?